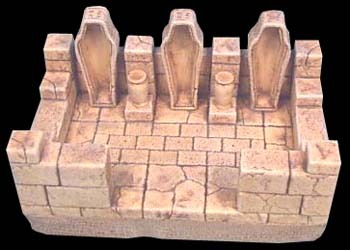 These tomb pieces use a variety of molds. 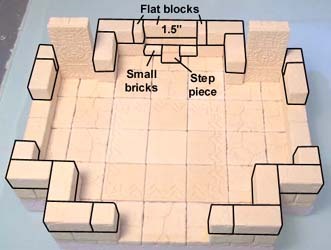 Click on the photo to see building instructions for each piece. Gather these pieces from mold #96. Glue together four 1" floor tiles. 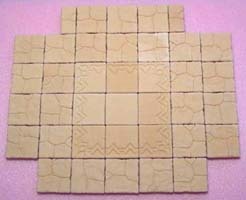 I chose the smooth tiles from mold #292, but you can just use regular floor tiles if you do not have this mold. 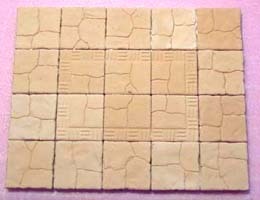 Glue the floor tiles onto a piece of foam board. Notice that I'm using some of the smaller floor tiles in the upper left corner. 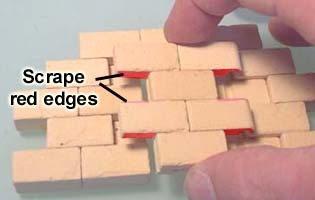 Glue the wall blocks around the outside as shown. 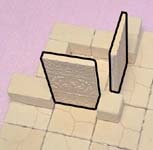 Glue two panels (decorative side facing outward) between the blocks. Continue to stack and glue the rows shown. The third row has a gap in the blocks to form a small window. 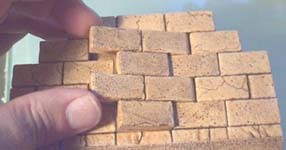 Glue on the remaining blocks and pillars as shown. Glue the four floor tiles on the top to cap off the little building. 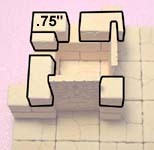 Collect the pieces shown here from mold #96. 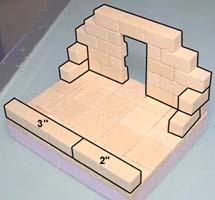 The blocks on the lower left are the secret door blocks. For a complete explanation of how the secret doors work, please look at our Tips & Tricks 17 page. Glue this wall section together but do not glue the panel in red. 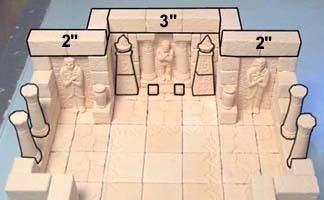 Notice that around the panel are four flat square wall blocks and to the right are two of the thick secret blocks. Let the glue dry completely before you go any further. These photos show how to make the door. Do not glue the blocks in red. These are just used as temporary spacers. 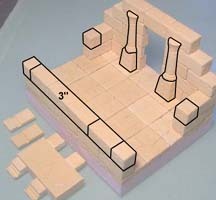 The blocks on the left are secret door blocks. Glue the panel on top. When dry, remove the spacer blocks. You will need to sand down the secret door to make sure it fits loosely. I cannot stress this point enough! Sand down all the edges (except for the hook side where the rod goes). I'm using a file to bevel the edge of the panel, which seems to catch when I try to open the door. Test fit the door by placing it in the wall. It should fit very loosely. 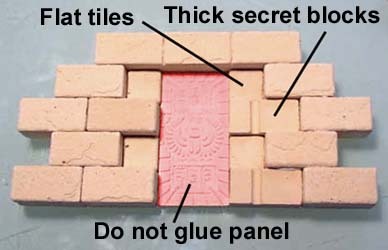 Use a hobby knife to scrape the inside edges of the door (shown in red). This wall section will have a coat of varnish (or paint) on it that will add thickness to the blocks. What begins as a nice fit will bind severely when you add a coat of varnish and stain. Do not glue in the door until after the pieces are painted. 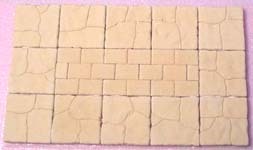 Glue together a grid of floor tiles 4 x 5 onto foam board. 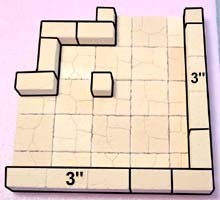 I've used some tiles from mold #291 here, but you can just use regular floor tiles if you don't have this mold. 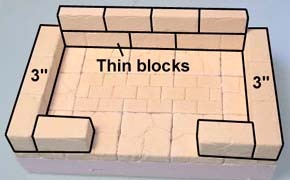 Glue the wall section and additional blocks shown on each side of the floor. Glue the remaining blocks on the room. When dry, paint the room before you glue in the secret door. Place an 1/8" dowel rod in the wall and glue the thin blocks on top of it. 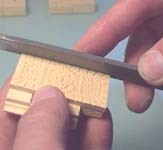 Do not glue the dowel in place. It must turn freely or the door will not work. Place a small amount of glue on the hinge part of the door and place it into the wall section. This will glue the door onto the dowel rod. 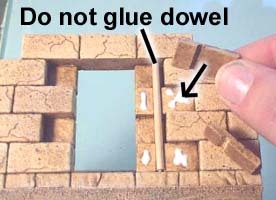 Do not use too much glue or you may end up gluing the dowel to the wall section. Here is the completed room with secret door. Be sure to not open the door too far. The secret door blocks with the "hook" on the ends are fairly delicate. These blocks will break if you open it too far. Glue together six regular blocks and one floor tile on the front. 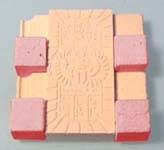 Glue the blocks on as shown. 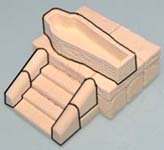 The finished coffin stand is shown in one of the plain rooms from the basic Egyptian tombs. Gather these pieces from mold #96. 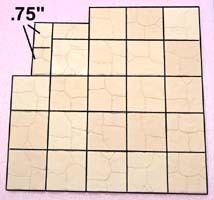 Glue these floor tiles onto a piece of foam board. The decorative tiles are from mold #292. 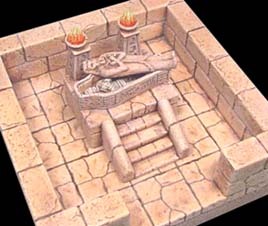 If you do not have this mold, just use regular floor tiles instead. Glue these two rows of blocks. Glue 2 floor tiles onto the back of each panel. 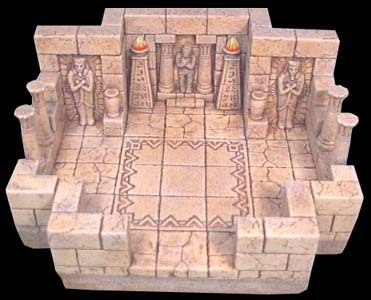 Add the vases, pillars, statues and flat blocks on the back wall. Finish the room by adding the torch sconces, pillars (glued back to back), and the small square bits on each side of the stair piece. Gather these pieces from mold #96. 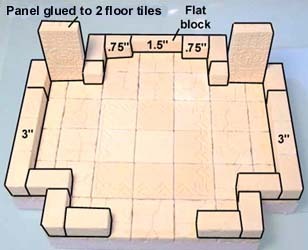 Glue these floor tiles onto a piece of foam board. The decorative tiles are from mold #291. 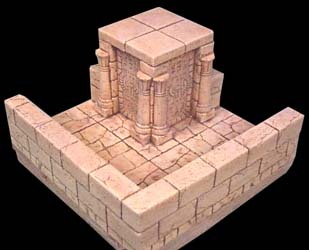 If you do not have this mold, just use regular floor tiles instead. 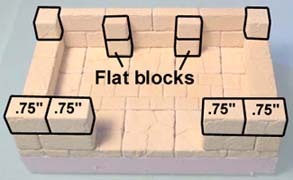 The back wall is made of thin blocks. Glue the additional pieces shown. 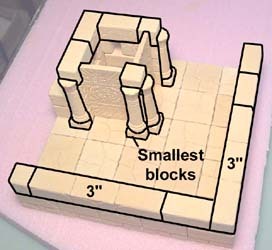 The remaining blocks are small square floor tiles, caskets and vases. 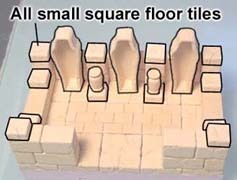 Painting between the caskets can be difficult, so you might try using cotton swabs as shown on our Tips & Tricks 17 page.